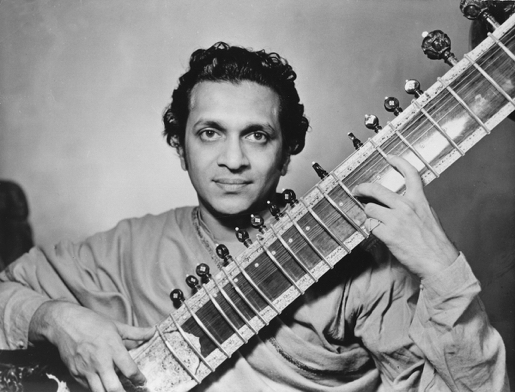 Exhibit alert: The Beatles and Ravi Shankar celebrated in two new exhibits. It was 50 years ago this month that The Beatles traveled to Rishikesh in northern India to study with Maharishi Mahesh Yogi. Inspired by George Harrison's continued exploration of Indian spirituality, the group joined their partners and associates, as well as other acolytes (including Mike Love, Donovan, and Mia Farrow) to study Transcendental Meditation. Harrison later said Ringo Starr stayed long enough to dip his toe in the water (only ten days), but Paul McCartney meditated for a month, and George Harrison and John Lennon stayed on for six weeks. After the pressures of producing Pepper and Magical Mystery Tour, the group's time in India became a well-deserved retreat. Many songs from the White Album were written during their stay. And coupled with Ravi Shankar's tireless work as international ambassador of Indian music, The Beatles helped to shine new light on that part of the world and helped to popularize Indian culture and meditation in the west. This part of the 1960s tale is being celebrated in two new museum exhibits! If your only exposure to Indian culture or sitar music is its incongruous placement in 60s genre films as code for 'spaced out', I urge Spy Vibers to explore these rich traditions of discipline and expression further. And if you are visiting filming locations from The Avengers, The Saint, and other 1960s spy shows, stop in at nearby Bhaktivedanta Manor, the Krishna center Harrison helped to create (and where you can see the George Harrison tribute garden). 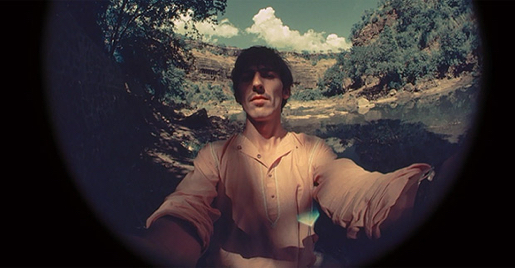 Below: One of Harrison's fisheye portraits taken during his 1966 trip to India. The Beatles Story in Liverpool have opened a new exhibit that highlights The Beatles in India, as well as Harrison's long friendship and collaborations with Ravi Shankar. From the press release: "Opening in February 2018 at the award-winning The Beatles Story in Liverpool, the new exhibition will look at this key and relatively unknown part of the Beatles’ story with never-before-seen memorabilia, imagery and personal accounts from the people who were there with the band in 1968. A sitar used by Ravi Shankar will go onto display within the new immersive area, loaned to The Beatles Story by the Ravi Shankar Foundation. 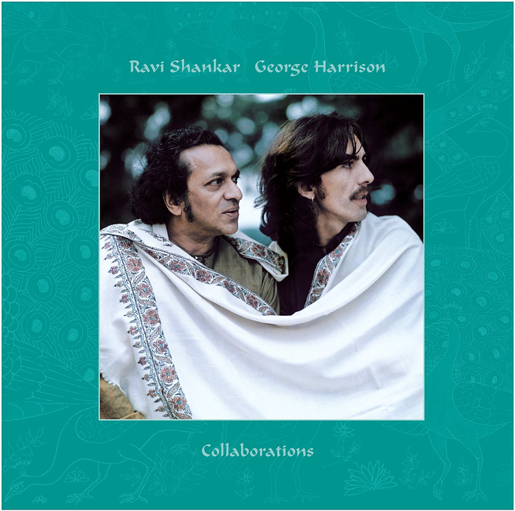 As George Harrison’s mentor, Ravi’s influence on the Beatle ultimately helped to popularise the use of Indian instruments in 1960s pop music. The exhibit will also include photography from Paul Saltzman (who took the image above here) a sound engineer for the National Film Board of Canada at the time, who photographed The Beatles during their stay. He is responsible for some of the most iconic and intimate images of the Fab Four in India. Pattie Boyd, former wife to George Harrison, and her sister Jenny Boyd, who were amongst the star-studded list of attendees in India, will be providing their personal insight into the time. The exhibit will look at the groups’ inspiration for the trip, their introduction into Transcendental Meditation as well as the songs they worked on in advance of their influential double-disc White Album. 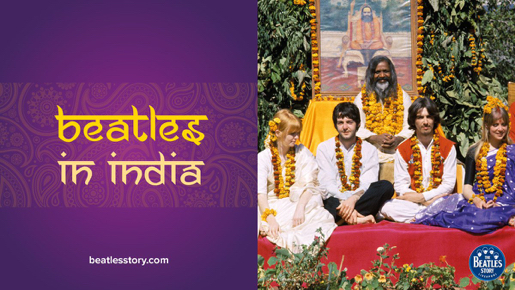 Speaking about her involvement, Pattie Boyd said: “I am delighted to have been invited to be a part of The Beatles Story's new ‘Beatles In India’ exhibition, marking the 50th anniversary of the trip to Rishikesh. It really was a special, magical time; forming many memories and, of course, an abundance of great Beatles music. I look forward to sharing thoughts and memories of India as part of the exhibition”. 2018 will also recognise what would have been George Harrison’s 75th birthday - the Beatle celebrated his 25th birthday with friends at the Ashram. Celebrations for this will form part of a year-long programme of unique Indian-inspired events, workshops and Q&A sessions. The new exhibit will be one of the highlights during a year in which Liverpool celebrates its fantastic cultural offering, ten years after the city was awarded ‘European Capital of Culture’ status. ‘Beatles in India’ will become part of The Beatles Story’s exhibition on the Albert Dock for two years and is scheduled to open to the public on 16th February 2018, 50 years to the day that John Lennon, George Harrison and their wives Cynthia Lennon and Pattie Boyd arrived in India." And while you are in Liverpool, check out the amazing British Music Experience (my piece about them for the Chris Barber website here). Also on the radar is the news that Anoushka and Sukanya Shankar have donated Ravi's 1961 sitar to The British Museum! From the Museum blog: "The sitar now on display in Room 33 is particularly special. It was made for the great musician Ravi Shankar (1920–2012) in 1961 by the Calcutta-based instrument maker Nodu Mullick. Mullick made four sitars for Shankar, and we believe this to be the first of the group. Ravi Shankar spent his whole life presenting the artistic traditions of his own country to the rest of the world. Initially he did this through participation in the dance troupe of his elder brother, Uday Shankar, but in his late teens, he gave up dancing in favour of music and above all, the sitar." He came from a family of Bengali origin though he was born in Benares (now Varanasi) in northern India, in 1920. His elder brother, Uday, was a well-known dancer who both studied and performed in London – incredibly he worked with Anna Pavlova, their piecede resistance, a pas de deux: Radha-Krishna. Uday is known to have visited the British Museum to study Indian medieval sculpture to enable him to better understand how to develop his new Indian dance. The wonderful gift of the sitar is therefore just the latest chapter in the history of connections between the Shankar family and the Museum." The gift has come from Sukanya Shankar, the widow of Ravi Shankar, their daughter Anoushka Shankar and the Ravi Shankar Foundation. Anoushka is also herself a renowned sitar player, both following in the footsteps of her father but also striking out on her own path of musical expression and discovery. The British Museum has put together a beautiful short film (below) to promote Ravi and the new exhibit (with wonderful footage from the film, Raga, produced by The Beatles Apple Films in 1971)." Related links: Nehru Jackets, Mod Fashion By Liam, Mod Style: Pretty Green, Roger Vivier, 60s Overdrive, Sgt. Pepper 50th, The Beatles: The Curious Camera, McCartney at 71, Revolver At 50, Ringo Rocks At 71, Pattie Boyd Exhibit, Peter Sellers to John Lennon: UK Satire, Ringo Tribute, John Lennon Remembered, Vintage Vinyl, Experimental Beatles, Ivan Vaughan, Essential Ringo, Paul at 72, Notes Behind the Curtain 1, Notes Behind the Curtain 2, Notes Behind the Curtain 3, Notes Behind the Curtain 4, 1960s Overdrive, Make Love in London, George Martin R.I.P., Tony Sheridan R.I.P., Cynthia Lennon R.I.P., Beatles at BBC, Kirchherr and Ono, Encouragement From Yoko, My Experimental Re-Mix & Film with Yoko, Lennon70 Tribute Film, Bowie Spies Berlin, Home Movies, Sean Lennon Release, Gilbert Taylor R.I.P., Atomic Art, Love Piece, Sean Lennon Scores, Sean Lennon Limited Edition, Fab Fall 2013, George Harrison, New Beatles Fashion. Selected Spy Vibe Posts: Mort Walker Celebration, Peter Wyngarde Celebration, Batman 66 Exhibit, Prisoner Fifty Event, Ian Fleming Publications 2017-2018, Interview: Ed Hulse Pulp, Avengers Audio Drama, Interview: Callan At 50, Interview: Playboys, Spies, Private Eyes, TWA Returns, Spy Vibe Radio 8, Interview: Ryan Heshka, Mid-Century Modern Schulz, Agent Werewolf, Mata Hair Exhibit, Johnny Sokko 50th, Interview: Trina Robbins, Eddie Izzard, The Prisoner Capt Scarlet 50th, Hugh Hefner R.I.P., Jack Good R.I.P., Interview: Shaken Not Stirred, Callan 50th, Spy Vibe Radio 7, The Prisoner 50th Event, Spy-Fi Event, Kaho Aso 007, Two Million, Bo Diddley, Carnaby Pop, Le Carre Events, Billy Bragg Skiffle, Elvis 68, Jack Kirby The Prisoner, Casino Royale Concert, Review: The Prisoner Vol 2, Interview: The Prisoner Essential Guide, Maud Russell Mottisfont, Spy Vibe Radio 4, Batman Gallants, Adam West R.I.P., Village Triangle, Roger Moore R.I.P., Spy Vibe Radio 3, Sgt Pepper 50th, Satanik Kriminal OST, 60s Overdrive, Make Love in London, Spy Vibe Radio 2, Spy Vibe Radio 1, James Bond Strips, Propaganda Mabuse, Interview: Police Surgeon, XTC Avengers, 1966 Pep Spies, Batman Book Interview, Exclusive Fleming Interview, Avengers Comic Strips, Robert Vaughn RIP, UNCLE Fashions, Thunderbirds Are Pop!, Interview: Spy Film Guide, Lost Avengers Found, The Callan File, Mission Impossible 50th, Green Hornet 50th, Star Trek 50th, Portmeirion Photography 1, Filming the Prisoner, Gaiman McGinnins Project, Ian Fleming Grave, Revolver at 50, Karen Romanko Interview, Mod Tales 2, Umbrella Man: Patrick Macnee, New Beatles Film, The Curious Camera, Esterel Fashion 1966, Exclusive Ian Ogilvy Interview, 007 Tribute Covers, The Phantom Avon novels return, Ian Fleming Festival, Argoman Design, Sylvia Anderson R.I.P., Ken Adam R.I.P., George Martin R.I.P., The New Avengers Comics, The Phantom at 80, 007 Manga, Avengerworld Book, Diana Rigg Auto Show, The Prisoner Audio Drama Review.